2015 Art-tini 1st place winner Cassidy Hughes for her mixed media artwork titled "American Rainforest Jazzy Jingle". 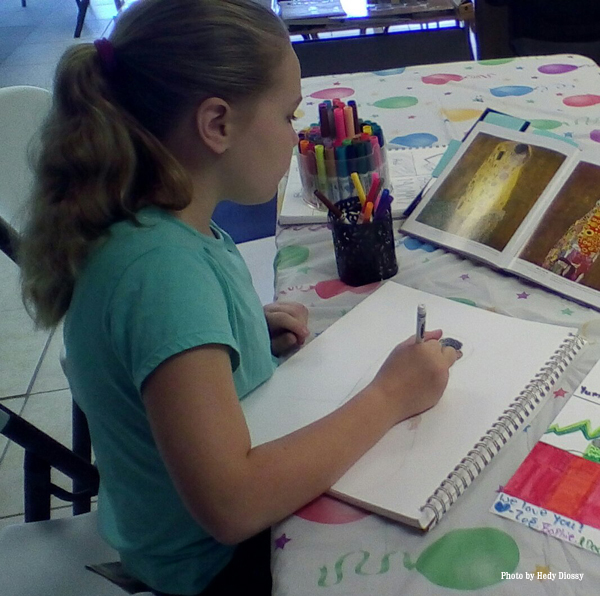 Our Vero Beach Art Club members mentor our area youth and new members who are joining the art club as seasoned artists, beginners or even art appreciators. Connecting our seasoned artists with art students and area youth to help encourage and stimulate their interest in art. From Volunteering to demonstrate their creative technique to art classes, to participating in school events and carnivals, we bridge the generation gap to bring artists together. Studies have shown that students who participate in art, music and other creative classes perform better overall in school. Vero Beach Art Club member Hedy Diossy mentors our local art students in many different ways. She has an After-School Children's Art Program. She sponsors some of our Junior members as well.